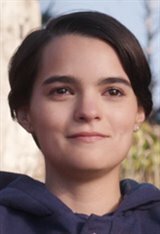 Brianna Hildebrand grew up in a small Texan town with her father, a car salesman, and her two older brothers. Her mother was largely absent from her life. As a child, she initially believed her calling was to be a singer-songwriter after she was given a guitar for her 12th birthday. She entered an International Models and Talent Association competition in Los Angeles at 17 and after she won, she moved to L.A. and began to take daily acting classes. Intimidated by the culture of Hollywood and auditions, Brianna took comfort in her singing and songwriting. She appeared in the web series Annie Undocumented, which was named best web series at the 2014 New York TV Festival. Nearly one year after moving to California, Brianna made her film debut in Deadpool (2016) alongside Ryan Reynolds as the Marvel superhero Negasonic Teenage Warhead. The success of the film encouraged the shy young woman to pursue more auditions for bigger projects and she now regularly attends fan events, such as Comic-Con, although she is not a comic book fan herself. While she was in Vancouver shooting Deadpool , Brianna auditioned and was cast as one of the leads in the romantic-drama First Girl I Loved (2016) which won an Audience Award: NEXT, at the Sundance Film Festival. Brianna, who is openly gay, said this film resonated very closely with her and her experiences in high school. She credits her accepting father and her gay manager for helping her come to terms with her sexuality. In 2017 she appeared in the comedy-horror Tragedy Girls (2017), co-starring alongside Alexandra Shipp as two aspiring high school serial killers. She also took to the small screen and had a recurring role in the second season of the TV series, The Exorcist.